You might have heard about automatic enrolment, the Government programme introduced in 2012 to boost retirement saving in the UK. The premise of the reforms is simple – by ‘nudging’ people into a workplace pension scheme and mandating employers match contributions up to a certain level, policymakers hope to arrest declining savings rates. The policy has to date been successful, with around nine in 10 of those auto-enrolled remaining in their scheme. But how much will you eventually be required to put into your auto-enrolment pension? And what could you end up with if you pay in the minimum throughout your working life? From April 2019 all employers will be required to offer employees a workplace pension, with rules prescribing a minimum total contribution, including tax relief, of 8%. For anyone being auto-enrolled at the lowest level, the jump from the current minimum employee contribution of 0.8% to 4% could feel severe. In fact, someone earning an average salary of £27,000 could see their annual pension outgoings leap from £169 to £879. The longer-term reality, however, is that for many people even this jump in the minimum contributions will not be enough. Let’s take a 25 year old earning £27,000 today who saves at the minimum for 40 years. Assuming 4% annual growth after charges and annual wage growth of 2%, they could have a total private pension pot worth £218,791 at age 65. 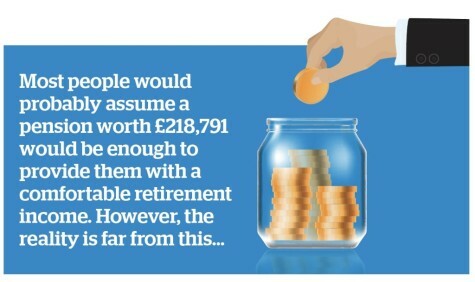 While this might sound like a lot of money, it would only buy a single-life inflation-linked annuity – which provides a guaranteed income for life – worth £4,966 a year after 25% tax-free cash has been taken*. Using income drawdown with the same pot of money after tax-free cash has been taken; an income of £10,000 could be withdrawn in order for the fund to last until age 90. However, any drop in investment returns or even a period of negative investment performance would dramatically reduce the income potential of the fund. Most people would probably assume a pension worth £218,791 would be enough to provide them with a comfortable retirement income. However, the reality is far from this and a generation of savers risk being hit with a brutal pensions shock unless they pay in more than the minimum. This isn’t just about pensions. Many people will choose to invest in ISAs, lifetime ISAs and other assets such as property as part of their retirement income mix.